The Chevrolet Bolt—officially known as the Chevrolet Bolt EV—is notable for being the first all-electric car produced by Chevrolet. Developed and manufactured in partnership with electronics company LG Corporation, the Bolt made its debut with the 2017 model year. There are two models available: the LT and the Premier. Riding on 17-inch aluminum wheels, the 2017 Bolt uses a body style that blends elements from the SUV and the station wagon. The doors, hood, and tailgate are made of aluminum to decrease the car’s weight. 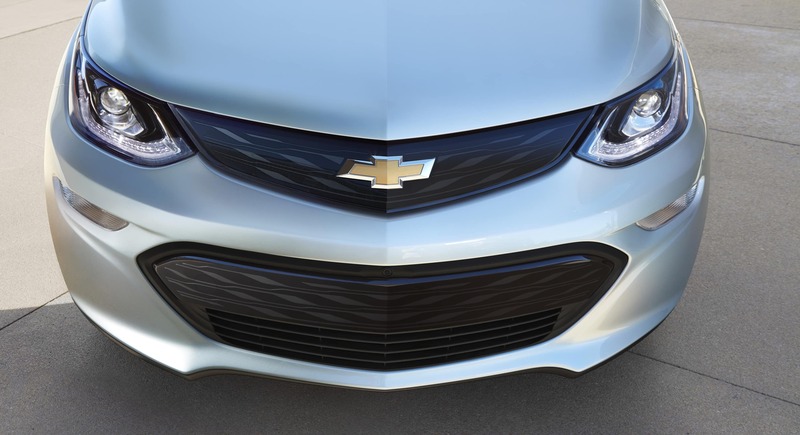 The high-intensity discharge headlights on the Bolt include low and high beam projectors for greater illumination, automatic on/off capability depending on the amount of outdoor light, and integrated LED daytime running lamps to increase its visibility to other drivers. Side mirrors with heating capability flank the front doors; on the Premier, they are power adjustable. Instead of regular halogen bulbs, longer-lasting LED ones are installed for the taillights. For more cargo carrying capability, go with the Premier, which has the addition of roof-mounted side rails. The 2017 Chevrolet Bolt is designated as a subcompact car that is designed to seat up to five people with 94.4 cubic feet of passenger volume. Although the trunk provides 16.9 cubic feet of cargo space, you can expand it into the cabin—thanks to the 60/40 split-folding rear seatback. At the front, both driver and passenger seats have 6-way manual adjustability. On the Premier, the front seats and steering wheel have heating capability, and the steering wheel is wrapped in leather. For entertainment, the Bolt comes with a six-speaker stereo system, which includes AM/FM radio, Bluetooth connectivity for streaming audio and handling hands-free phone calls, voice activation for radio and phone functions, dual USB ports and an auxiliary audio jack, a free three-month SiriusXM satellite radio subscription, Android Auto and Apple CarPlay for smartphone-based control, and a huge 10.2-inch color touchscreen. 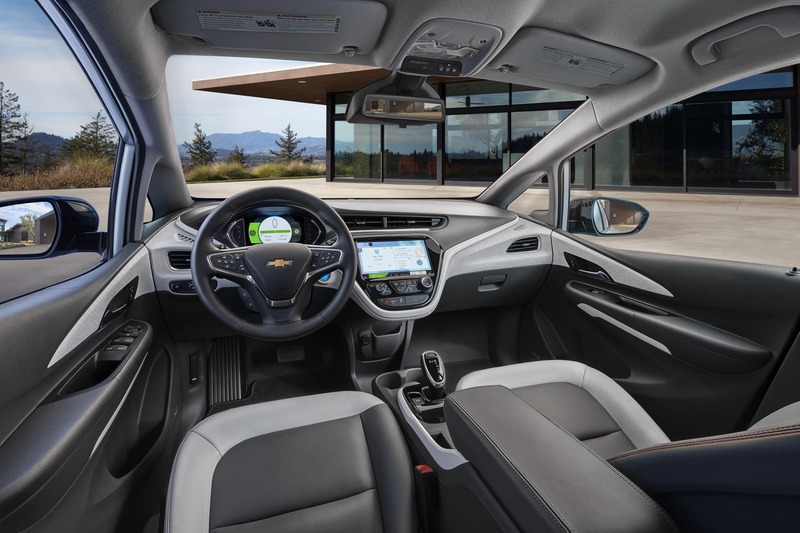 Other interior features on the Bolt include remote keyless access, a rearview camera, remote vehicle start capability, push-button engine start, steering wheel-mounted controls, a Wi-Fi hotspot for 4G LTE Internet access, and an 8-inch multi-color driver information center. The camera on the Premier has 360-degree vision, instead of a rear vision perspective; and auto dimming capability is added on the rearview mirror to dim headlights flashing from behind you. 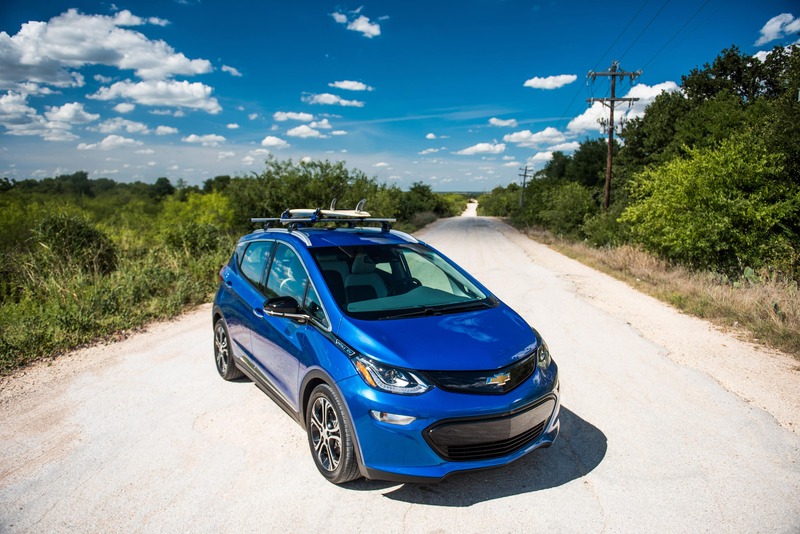 Possessing a front-wheel-drive layout, the 2017 Chevrolet Bolt uses a four-wheel performance-oriented “Ride and Handling” suspension—which consists of a front independent MacPherson strut and rear semi-independent compound crank design—to keep road turbulence to a minimum. The non-variable electric power steering provides more assistance during low-speed maneuvering or less assistance when on the highway. Attached to the steering wheel is the Regen on Demand™ paddle for less energy-consuming stopping ability. This feature is combined with the all-wheel anti-lock disc brakes, which are designed to shorten stopping distances and prevent wheel lock-up when applying the brakes. 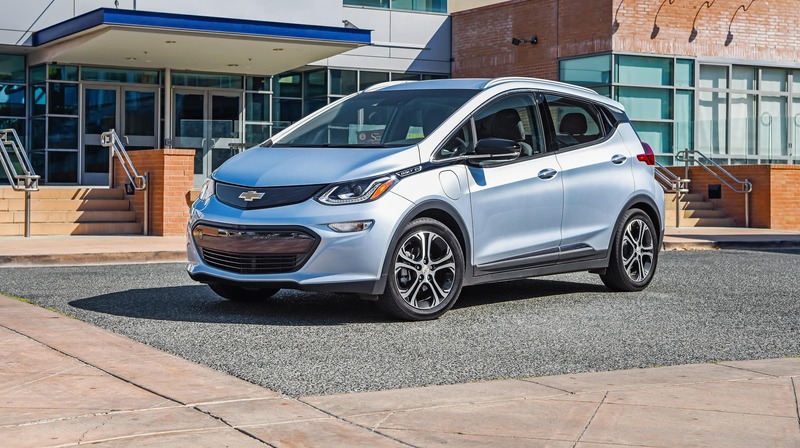 Also, the Bolt is notable for its “one pedal driving,” which means that you can adjust the regenerative braking level as you lift your foot from the accelerator pedal. 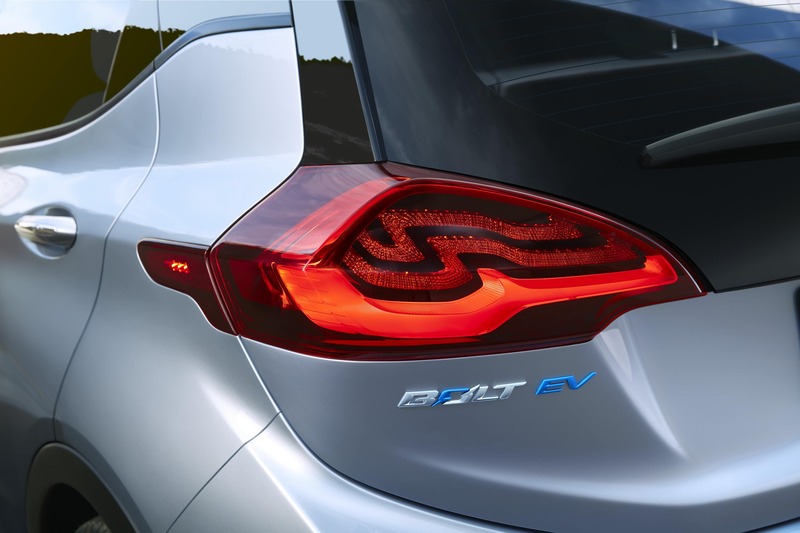 The 2017 Bolt’s powertrain is called Electric Drive Unit, which consists of an electric motor with a 60 kilowatt-hour lithium-ion battery that generates 200 horsepower and 266 lb-ft of torque. Instead of a traditional gearbox, the Bolt has an Electronic Precision Shift, which is a single-speed electronic transmission selector with Low mode for regenerative braking, in addition to Normal and Sport modes. With its powertrain, the 2017 Bolt can go from 0 to 60 mph in 6.5 seconds. City and highway fuel economy is EPA estimated at 128 mpg and 110 mpg, respectively. The 2017 Chevrolet Bolt is armed with 10 safety airbags. Two of them face the driver and front passenger for front impact, and two more serve as knee airbags for the front occupants. Each front seat is mounted with a side impact airbag for protecting the thorax, and two front and two rear side curtains are installed on the roof for head protection of all occupants. The OnStar communications system on the Bolt comes with a five-year Basic Plan subscription that includes vehicle diagnostics and dealer maintenance notification; and a three-month Guidance Plan that includes automatic crash response, roadside and stolen vehicle assistance, and turn-by-turn navigation. 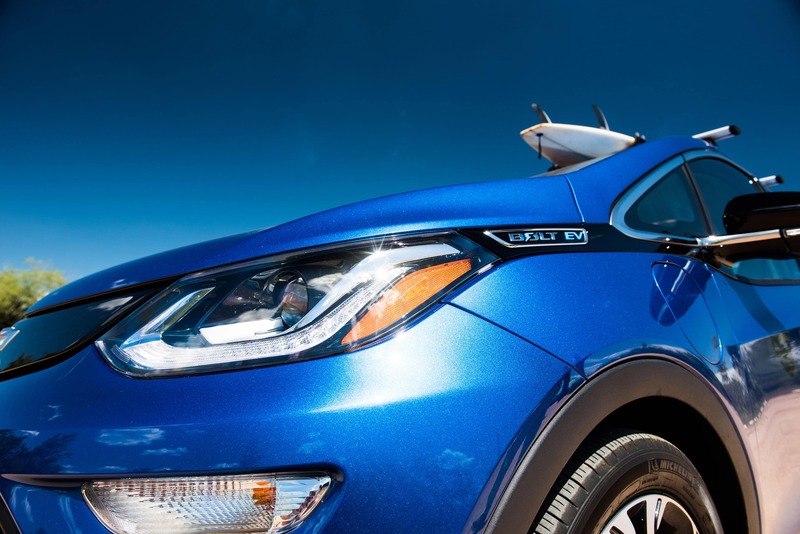 Also included on the Bolt are StabiliTrak for electronic vehicle stability, four-wheel anti-lock disc brakes, a Teen Driver feature for governing the behavior of younger drivers, and an anti-theft system that incorporates remote keyless entry, a panic alarm, and engine immobilization. Added on the Premier trim are rear cross-traffic alert, rear parking assist, and side blind zone alert with lane change alert. For Fox Lake IL Area 2017 Chevrolet Bolt in the Fox Lake IL Area, contact Libertyville Chevrolet today. 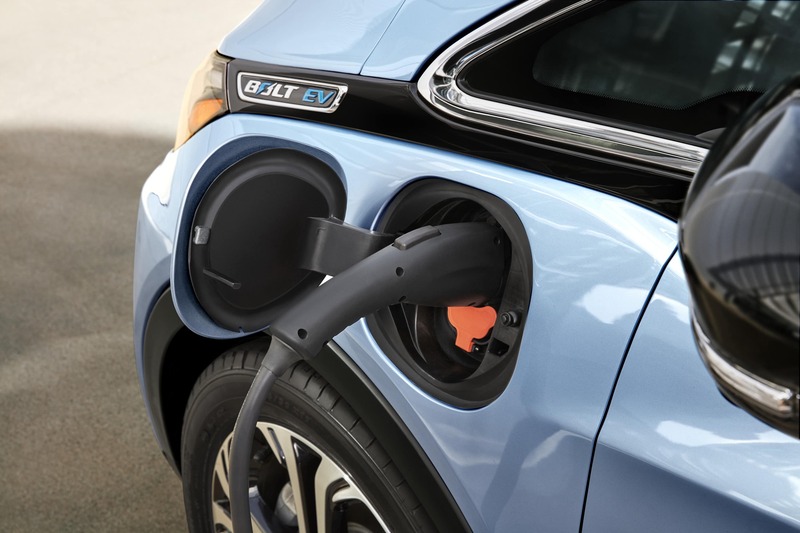 As a Chevy Bolt dealer based in Libertyville, we have been serving Fox Lake Illinois and other towns and cities in the Chicago metro area with quality Hyundai vehicles. 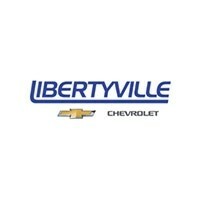 Contact Libertyville Chevrolet today for Fox Lake IL Area or Fox Lake IL Area 2017 Chevrolet Bolt. One of our sales specialists serving Fox Lake Illinois will be more than willing to assist you in getting into the 2017 Chevrolet Trax of your own specifications.